Being taller is not always an easy job. Being tall has many advantage in most of the aspects of life and if you look it from a professional point of view then tall people have many more plus points then a normal heighted person because this being a tall ability enhances their personality and impression as well. Especially when it comes to military or army, then tall people with good physique are preferred the most. Yasutaka Okayama, who was born on November 29, 1954 in Kumamoto Prefecture, Japan was the tallest basketball player drafted in National Basketball Association history. This 7'8" center was selected by the Golden State Warriors as the 10th pick of the eighth round of the 1981 Draft, although he did not sign with them. Okayama practiced Judo at junior high school and high school, and obtained a second degree black belt. He started playing basketball when he was eighteen at Osaka University of Commerce. He attended the University of Portland but never played for their basketball program as he was a project. After graduation, he joined the basketball club of Sumitomo Metal Industries. He represented Japan between 1979 and 1986 before he retired in 1990. He still works for Sumitomo Metal and is very active as a basketball coach. He has also written a book for young basketball players. He is known popularly as the tallest Japanese as well tallest to be drafted into the NBA at 2.34 meters ( 7 ft 8 in ). George Bell is currently the tallest living American in United States. 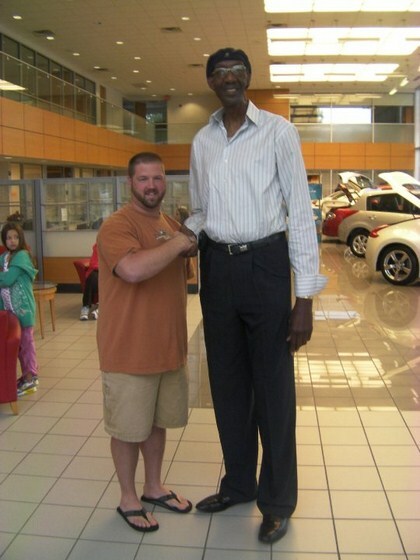 George Bell was born in 1957 and has an honor of getting his name listed in the Guinness Book of World Records as one of the tallest man alive right now. George Bell is a patriotic natured person who loves to serve his country in any aspect and that reflects his profession as well. George Bell is a deputy sheriff in Virginia and leading a life serving his country. Along with that George Bell used to be a very good Basketball player in his golden days and has played among very famous teams. The measured height of George Bell is 7 feet and 8 inches which makes him the 9th tallest man alive right now. Igor Vovkovinskiy basically belong Ukraine and moved to Rochester, Minnesota for his treatment. One of the most astonishing things which you will come to know is this that Igor Vovkovinskiy was more than 6 feet tall at the age of only 7 and weighed 200 pounds. This huge giant also has the honor of being called one of the biggest supporters of Barrack Obama. According to Igor it sometimes gets very difficult to manage the things because of his huge height. The measured height of this tall guy is 7 feet and 8.33 inches which makes him the 8th tallest living person of the world. Radhouane Charbib belongs to Tunisia and was born on 27th October 1968. Radhouane Charbib used to be the tallest man of the world once and got his name listed in the Guinness Book of World Records. Radhouane Charbib realized this at the age of 15 that he is growing in his height pretty fast then a normal human being and at that time at the age of 15 he was already 5 feet and 7.4 inches tall. According to Radhouane Charbib he is very much happy from his height and says that it’s a special gift and he feels very happy at that time when walking along the street and people always keep on looking at him with eyes wide open. 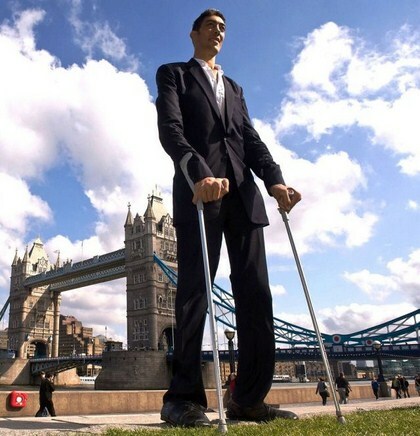 The measured height of Radhouane Charbib is 7 feet and 8.4 inches which makes him the 7th tallest man alive on earth now. Ri Myung Hun belongs to North Korea and was born on 14th September 1967. Due to the tall height of Ri Myung Hun he was selected in the National Korean Basketball team and was one of the leading scorer and backbone player of his team. Ri Myung Hun is living in capital city of Pyongyang along with his wife and son and due the tall height of the father his son is also becoming a minor celebrity day by day. Ri Myung Hun biggest dream is to play in NBA (National Basketball Association) but due to the the cold war between North Korea and United states this dream is fading day by day. The measured height of this tall Basketball player is 7 feet and 8.5 inches which makes him the 6th tallest man alive on the planet now. Sun Ming Ming belongs to China and was born on 23rd August 1983. Sun Ming Ming is a professional Basketball player and is considered as one of the tallest man who played Basket ball ever professionally for a long period of time. Sun Ming Ming is living a life like a celebrity and sometimes on special requests he make guest appearances at various occasions and TV shows. Sun Ming Ming moved to USA in 2005 and tried hard to get selected in NBA and start a career but was unable to succeed. He returned back home and now is playing Basketball professionally in China. 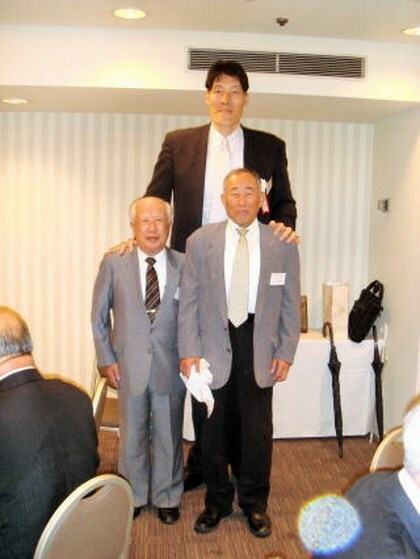 The measured height of Sun Ming Ming is 7 feet and 9 inches which makes him the 5th tallest man alive in the world. Bao Xishun Belongs to China and was born in 1951. Until the age of 16 Bao Xishun used to think that he was an average person of normal height but after that he gradually kept on growing taller. Bao Xishun used to work in a Local hospital in a city named Chifeng. Along with the plus point of height Bao Xishun was a good Basketball player and has played in the army Basketball team of China for 3 years. Bao Xishun was married to Xia Shujuan who was a sales girl. The marriage took place on 24th March 2007 and now Bao Xishun is a father of a cute son. 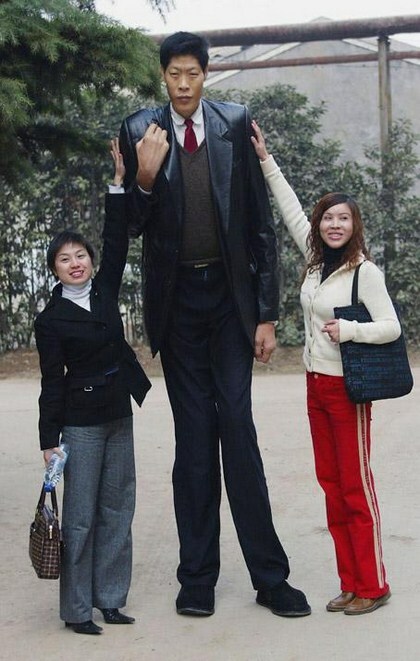 Bao Xishun used to be the tallest man on earth according to Guinness Book of World Records. 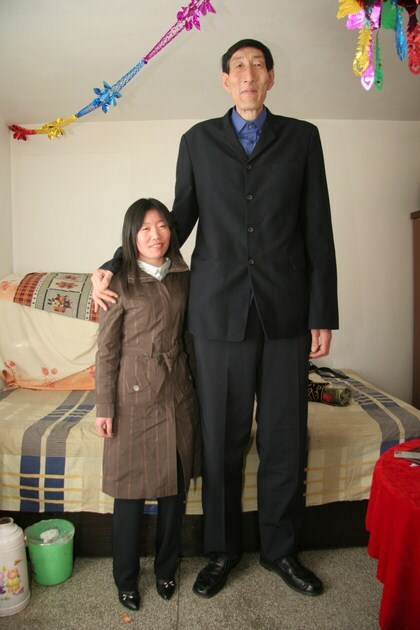 The measured height of Bao Xishun is 7 feet and 9.5 inches which makes him the 4th tallest man alive on the earth. Zhang Juncai is the 2nd tallest man alive right now. Zhang Juncai was born in 1983 and he belongs to china and most of the time he has been seen involved in social activities like as a special guest in tv shows and performances. Zhang Juncai has a nice nature and is friendly at heart. Zhang Juncai also visited the hospital meet the sick giant lady Yao Defen who ranks 3rd in the list of Top 10 tallest females of the world. Along with that, Zhang Juncai also met the fattest man of china named Liang Yong weighing 200 Kgs. 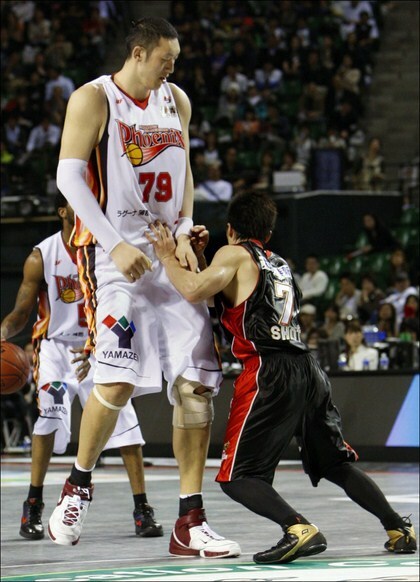 Zhang Juncai has been seen walking in streets of china sometimes with Bao Xishun who is 7 feet 9 inches tall. According to Zhang Juncai this whole world is their home and they have to rule in it. The latest measurement of Zhang Juncai height is 7 feet and 11.3 inches and he is the 3rd tallest man of the world alive right now. Takioullah was born in Guelmim, Morocco, in 1982. At the age of 18, he had been asked by his school doctor to get a blood test, for his "unusual" size. Diagnosed with acromegaly, Takioullah, in a single year had a metre high growth spurt. 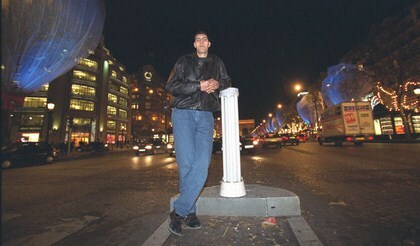 After obtaining his university degree in geography, a French doctor brought Takioullah to Paris in 2006, for treatment. A team of doctors in France are currently working on reducing his tumor which is affecting his pituitary gland. His orthopedic podiatrist, Jerome Liegeon, fitted him with a specially made pair of shoes, specifically designed to support his weight. Takioullah became the Guinness World Record-holder for world's largest feet on a living person, on 24 May 2011. His left foot measures 38.1 centimetres, and his right 37.5 centimetres. 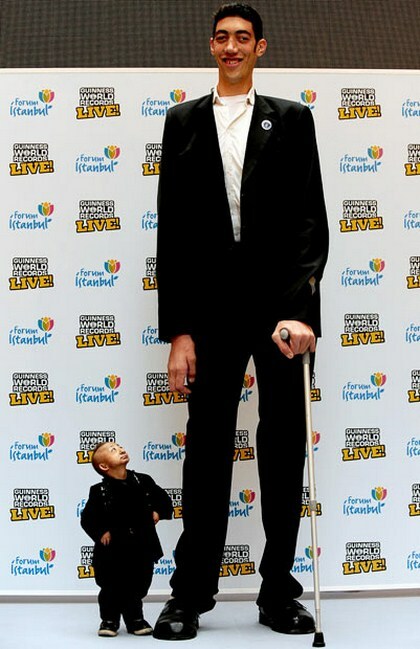 With a height of 2.46 metres (8 ft 1 in), Takioullah is the second tallest living person in the world according to the Guinness World Records, behind Sultan Kösen. Sultan Kosen is tallest man alive on earth in the present age because he has been given this title by Guinness Book of World Records. Sultan Kosen was born on 10th December 1982 and he basically belongs to Turkey. Sultan Kosen loves to play video games with his friends. From his point of view, being taller is a good thing because wherever a ladder is required, he just does the task standing on the ground. Sultan Kosen loves to walk around with his hand sticks and in reality he is a very friendly natured person and loves to communicate with people on most of the topics. One of his biggest dreams of life is to get married and have children. Sultan Kosen loves to attend different occasions and charity based parties. The recorded height of Sultan Kosen is 8 feet and 3 inches and he stands at the first place in our list of top 10 tallest man alive.